CES is taking place this week and there are many announcements that have been made. It’s been a particularly important week for Xiaomi as they had previously announced a launch event for their new sub-brand, Redmi. Instead of keeping the Redmi budget devices mixed in with Xiaomi’s Mi devices, they feel it’s best to separate the two so the Mi devices start to become looked at as the premium and high-end products they are. Today was the reveal of their first smartphone under this sub-brand, the Redmi Note 7, but they also mentioned the Redmi Note 7 Pro is in the works with the 48MP Sony IMX586 image sensor. We first talked about this IMX586 image sensor from Sony back in July of last year. It was then when we learned this sensor was made for low-light photography (which tends to be a difficult task for normal smartphone cameras) and it’s a sensor that Honor is using in their newly announced Honor View 20 smartphone. Xiaomi tends to launch multiple variants of their devices for various price points. So today’s launch revealed the regular version of the Redmi Note 7 that will come with a 6.3-inch full HD+ display, Snapdragon 660 chipset, and be priced between 999 yuan (~$147) and 1,399 yuan (~$206) depending on which version you go with (there will be three versions of the Redmi Note 7 to choose from). That particular device will launch with a 48MP camera, but it will be one from Samsung. 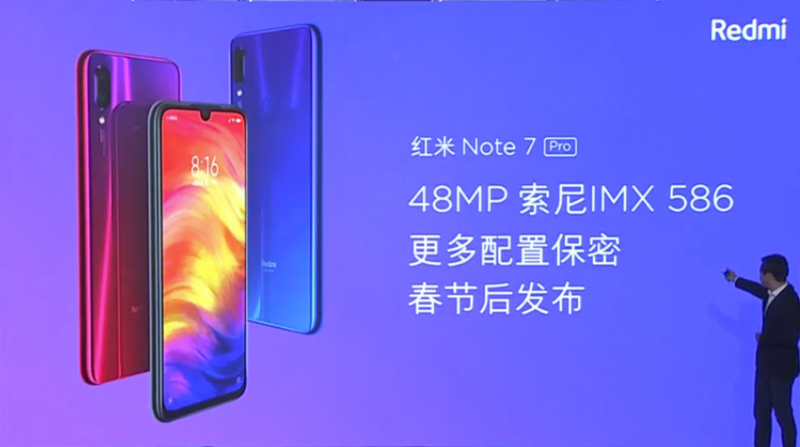 During today’s launch event, the company also revealed that a Redmi Note 7 Pro is also in the works and it too will be equipped with a 48MP camera. However, instead of using Samsung’s camera sensor in the Pro version, Xiaomi will be opting for the 48MP Sony IMX586 sensor instead. This version will be launching later than the regular model (likely the Chinese New Year) but they have yet to reveal pricing or specific release date information on this Pro variant.